As we slog away once again on Federal Communication Commission (FCC) Chairman Ajit Pai’s summer blockbuster reboot “Net Neutrality: The Mummy Returns!,” it’s worth noting in passing the anniversary a previous Pai celebration of industry self-regulation, #DitchTheBox. I bring this up not merely as a fairly bitter bit of Cassandrafreude, but to remind everyone why only those who most desperately want to believe ever put any faith in “industry self-regulation” — especially when that industry is the cable industry. The cable operators, along with the telcos and other broadband access providers, all claim to loooove the basic idea of net neutrality and a “free and open Internet.” Mind you, we still have the occasional True Believer trying to tell us how good for us it would be if ISPs could “innovate” in exciting pricing plans like “screwing with your video streaming to charge you extra” or “blocking/degrading your efforts to access peer-to-peer applications without telling you.” But as an industry, the major broadband providers have recognized that they need some kind of fig leaf concession (preferably cemented into law by a compliant Congress). And so we have seen the cable companies falling all over themselves to swear their undying support for net neutrality and promises to do nothing to harm the open Internet. So a brief review of the history of cable industry self-regulatory promises, and Chairman Pai’s willingness to believe them, seems in order for the day. Indeed, Chairman Pai has been so taken with the display of sincerity from Cableland that he not only echoes his same commitment to “an open Internet,” but has proposed (and sought comment on in his Notice of Proposed Rulemaking) not having any enforceable FCC rules at all. Instead, Pai has suggested that instead of rules, broadband providers simply promise to commit to net neutrality “principles.” Of course, in Pai’s vision, the FCC would not do anything as overbearing or intrusive as enforce these provisions. That would be left to the Federal Trade Commission, since Pai apparently thinks that the FCC should be putting itself out of business when it comes to broadband. And after all, why would cable operators lie? But why bring up endless old stuff when we can look at the most recent example of “we will promise anything to avoid actual, enforceable rules,” cable’s promise to eliminate the need for a set-top box at all — and Pai’s totally cheerleading this promise as ever so much better than actual, enforceable rules. Remember How Cable’s Promise to “Ditch The Box” Was Supposed to Be Better Than “Unlocking” It? To review briefly, in 1996 Congress added Section 629 (now codified at 47 U.S.C. 549) to the Communications Act, requiring that providers of pay-TV subscription services (“multichannel video programming distributors” or “MVPDs” in telecom jargon) allow independent third parties to make set-top boxes or other “navigation devices” needed to access their services. The law required the FCC to create rules to implement this law. Needless to say, the FCC botched it terribly. You can read the whole history up to 2014 in this blog post here if you want. Last year, as part of his whacky maniacal campaign to have the FCC actually enforce the Communications Act and protect consumers and stuff, former FCC Chairman Tom Wheeler voted out a Notice of Proposed Rulemaking that would require MVPDs to adopt a standard that would allow third parties to make set-top boxes so people could buy set-top boxes (or purchase ready-for-cable TVs again, remember those?) rather than lease them from their cable provider. You can get more background on the whole #UnlockTheBox campaign here on the Public Knowledge website. While wildly popular with cable subscribers, the proposal drew sharp resistance from the cable industry and its lobby machine, and for pretty much the same reason. Cable operators make oodles and squindoodles of money by charging subscribers ridiculous rental fees for set-top boxes. Since “we demand the right to keep ripping off consumers” is not something you can generally say out loud when lobbying against a rule, the cable industry needed to come up with another reason for the FCC not to adopt the rules. One of the big arguments they came up with was that cable operators didn’t even really want to be in the set-top box business at all — despite the squindoodles of money they made from set-top box leasing fees! No, cable operators claimed they wanted to eliminate the set-top box entirely, and were all set to do that if the FCC would just not adopt the proposed nasty government regulations that would (they claimed) force them to keep the horrible set-top box that no one loved, least of all themselves. And didn’t the cable operators promise to do just that! They submitted a full blown proposal/promise to the FCC, promising to eliminate the need for a set-top box by developing applications to be available on third party devices. The cable operators committed to a two-year timeline. Sure, they were a bit vague on the details, even when pressed by the FCC in an official request for details. But that did not stop Commissioner Pai — and pretty much the same people who today object to imposing actual enforceable net neutrality rules — from trusting the cable industry promises and using these promises as a reason not to impose actual, enforceable rules to protect consumers. After all, who needs an actual, enforceable rule when the cable industry promised to get rid of the set-top box. I mean, they totally and sincerely promised that they hated making set-top boxes and totally wanted to “innovate” in consumer friendly ways. Really. Totally. Why would I lie? And Commissioner Pai, bless his trusting heart, totally believed them. Surprising nobody who actually follows this stuff, and does not suffer from willful blindness, the cable industry has now ditched its #DitchTheBox plan. Comcast has a beta test app available on Roku, but Comcast will still charge you an “access fee” (but not a set-top box fee!”) similar to what it charges today. Or, in other words, once the regulatory pressure came off, the cable industry suddenly was no longer honestly, sincerely and totally committed to getting rid of the set-top box, despite their honest, sincere and total commitment to doing so. Just as their total devotion to eliminating the set-top box did not become public until enforceable rules to protect subscribers and promote competition became a real possibility, their disgust with set-top boxes and desire to get out of the set-top box business ended when the incredibly credulous Chairman Pai made it clear enforceable regulation was off the table. So What Have We Learned for Net Neutrality and Title II? I get that Pai is a proud resident of Econ Cloud Cuckoo Land, with its almost religious worship of the gods of the marketplace who get offended at the mere thought of enforceable consumer protections or enforceable rules to promote competition. But believing that profit-maximizing firms will not seek to maximize profit because they promise to protect net neutrality and will repeat endlessly to anyone who listens how much they love and respect the open Internet is being willfully blind. History shows that the cable industry will say anything to avoid actual enforceable regulations, then cheerfully go back to doing whatever the heck they want and charging whatever the heck they want. While I don’t think Pai is in the pay of his cable industry masters, I do think “there are none so blind as will not see” — and Pai is utterly committed to not seeing anything wrong with trusting the cable companies to keep their promises. Which is why we need Title II, since the D.C. Circuit has made absolutely clear that the only way the FCC can have enforceable rules that prevent blocking, degrading or prioritizing content is by classifying broadband as a Title II common carrier. Saying you love an Open Internet but hate Title II is like saying you are totally committed to a healthy lifestyle except for the diet and exercise part. Or like the cable industry promising to totally get rid of the set-top box. And same thing for “I love net neutrality but want the Federal Trade Commission to do it.” It was unacceptable in 2006, it hasn’t gotten more acceptable today. 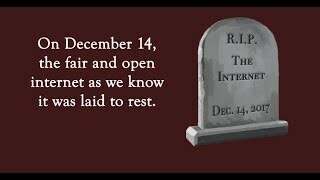 So for today’s Net Neutrality Day of Action, it’s time to stop believing in the promises of cable companies and fight to keep actual, enforceable rules. 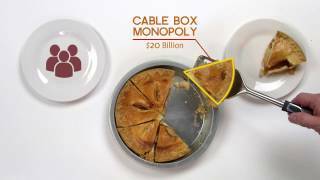 If we don’t, the open Internet will go the way of cable’s #DitchTheBox campaign.